Celebrating the end of the 2014 harvest season! Sick of hot summer days? Well, you’re in luck. Astronomically speaking, anyway! Okay, so we haven’t unpacked anything winter yet, we’re not closing our windows at night, and there’s really no crispness in the air, but autumn really is here! Autumnal Equinox, that key moment in the earth’s annual orbit, when day time and night time are equal in length, arrived on September 23rd. And “weather” we like it or not, it signals the beginning of fall. And for us here in wine country, it signifies the end of our harvest season. Just about everything in the valley is picked, crushed, punched down and pumped over. 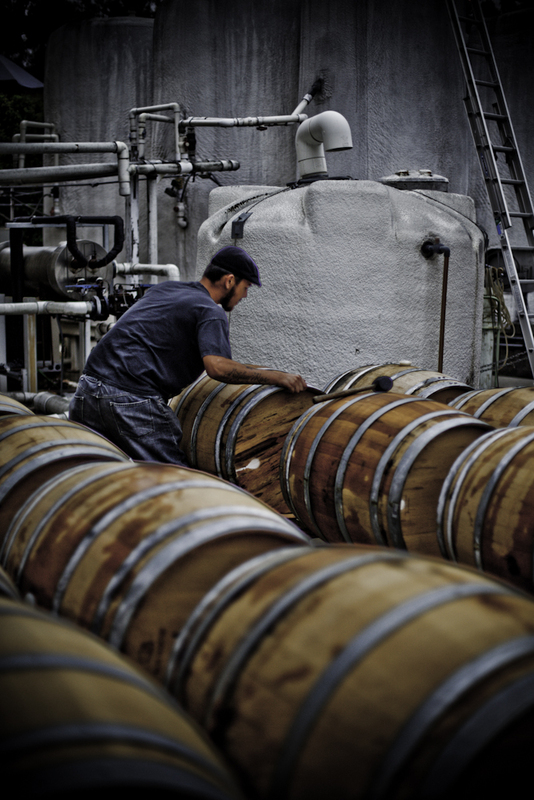 The wines have settled down for their long winter’s nap, all snug in tank or barrel. The winemaker’s work is done. Ha! Not really, but at least now they can get a day or two off and enjoy some well-deserved rest. But what do WE do? We get ready to celebrate! And make merry we will, at our upcoming Harvest Celebration on November 1 and 2, 2014. Not only commemorating the end of the harvest season, but re-tasting all those unfinished wines that were barrel sampled last year which are now bottled and ready for release. So join us for two, fun-filled days of wine and food sampling at our 30+ member wineries. Tickets are on sale now. Don’t miss out! Posted in Association News, Events, Winery News | Comments Off on Celebrating the end of the 2014 harvest season! Come join us for Temecula Valley’s final passport event of the year! Harvest Celebration Weekend is November 2-3. There’s just 10 days left to purchase tickets for $10 off! Now through 10/2. 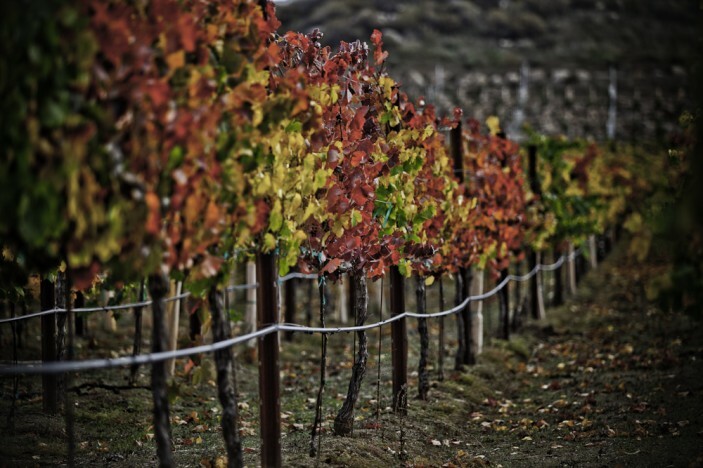 The Temecula Valley Winegrowers Association presents the 23rd Annual Harvest Celebration, on November 2 and 3, 2013. Each passport ticket comes with a souvenir logo wine glass, a winery map and a pairing menu listing the wines and foods offered at all participating Rancho California and De Portola Road wineries. PLUS! You can vote for the Best Winery Scarecrow for a chance to WIN 4 TICKETS to the next World of Wine Winter Barrel Tasting event on March 1 & 2, 2014. Click Here to Purchase Your Harvest Passport Ticket Now or call 800.801.9463 to order your tickets by phone. Tickets will sell out – so get yours today! The 22nd Annual Harvest Celebration is this weekend – November 3 & 4! Live Bands every Saturday night from 5-8pm. Appetizers, drinks and dinner available. Saturday November 24: The Hats-The Hats know how to swing! Bring your pooch to wine country. Every Sunday live music, doggie menu, doggie treats. Sundays 11:30 to 3:30pm. Call 951-676-WINE (9463) for more information. Buy 2 bottles of any white wine and receive the 3rd white (of equal or lesser value) for 1 cent. (Offer is valid at Winery only and cannot be combined with any other discount, including wine club). Danza del Sol Winery is pleased to announce that The Club House @ Danza has been selected to participate in the 28th Annual Temecula Valley Women’s Club Holiday Home Tour. It is the first time a winery has been asked to participate in this Temecula holiday tradition. The event is open to the public to visit all five of the homes that will be decorated. Tickets are available for purchase here. Come meet Al Camano, winner of the 2012 SCCA Touring Regional Championship. His winning car, a Chevrolet Corvette C6T1, will be on display for all to see and photograph. Italian Wedding soup will be offered. Doffo Winery is the official sponsor of this racing team. Gourmet 4-course French dinner prepared by Europa’s own award-winning Executive Chef Dean Thomas. Each course paired with Europa Village C’est La Vie wines. Top it off with performances by Europa’s own singing waiters. Sunday, Nov 17; 6:00-9:30pm. Tickets are $99+ tax. Now that harvest is winding down our winemaker, Tim Kramer, would like to extend a personal invitation for you to join us for our Annual Winemaker Dinner. This is your chance to meet and interact with our winemaker, enologist, and the owners of Leoness. Enjoy live music, delicious food, and excellent wines. Make reservations today 951-302-7601 ext 150. November 18th – thru Dec 23rd. Sundays only from 2-4pm. First come, first served; gratuity is appreciated. For more information, please call (951) 587-6221. Mulled Wine willl be available for purchase by the glass at both the Wine Country and Old Town locations. Every Friday-Sunday starting Nov 2 through Christmas. Lorimar’s Grand Lighting Ceremony Fri, Nov 30 – Live Music 5-8pm: Witness wine country’s most beautiful lighting ceremony. At 8pm, to the sounds of Christmas Carolers and the smell of spiced mulled wine, Lorimar will illuminate its wine country estate and the 6 themed Christmas trees inside. 6:00p-9:00p every Friday throughout the Fall. November 22 — Gourmet Thanksgiving Feast…. The Master Chefs and Winemakers of South Coast Winery Resort & Spa are ready to treat you and your entire family to a special gourmet feast this Thanksgiving Day, featuring unique presentations of today’s traditional fare. Specially priced menus are sure to make you stop and give thanks for this special day. Reserve early for preferred seating. 866-994-6379 X 7237 or visit us online at WineResort.com. Reservations required. November 25 – Tree Lighting… Let your inner child come out to play; and while you’re at it, bring your entire family. Come enjoy our popular South Coast Winery Winter Fun in our beautiful Southern California Wine Country sun. Meet us in the Courtyard at 6 PM as holiday music fills the air and our popular holiday lights get turned on officially to delight and dazzle, making your Season merry and bright! 866-994-6379 X7210 or visit us online at WineResort.com. November 29 – Deck the Halls Spa Event… Be one of the first to enter into the Holiday spirit. The GrapeSeed Spa at South Coast Winery Resort invites you to their elegant Deck The Halls Event from 6.30pm to 9.00pm. Offering a vendors showcase, fantastic spa prizes and product giveaways, and complimentary wine whilst shopping at this social extravaganza. Also be one of the first to sign up for some incredible spa package promotions that can only be enjoyed by attending this event and can be redeemed during the holiday season. This event is open to Spa Club and Wine Club members only. RSVP early to avoid disappointment. 866-994-6379 X7210 or visit us online at WineResort.com. Inspired by the small family run restaurants in the wine country in Italy, this wine and chocolate class is truly amazing! You will be guided through the tasting and learn the in’s and out’s of chocolate and wine pairing. An elegant buffet of all your favorite Thanksgiving favorites included Champagne & Mimosa cocktails. Bring 3 cans of non perishable items to the gift shop and and receive a two for one tasting. Temecula Valley wine country invites locals and visitors alike to celebrate this year’s wine grape harvest at the region’s 22nd Annual Harvest Celebration Barrel Tasting Weekend. 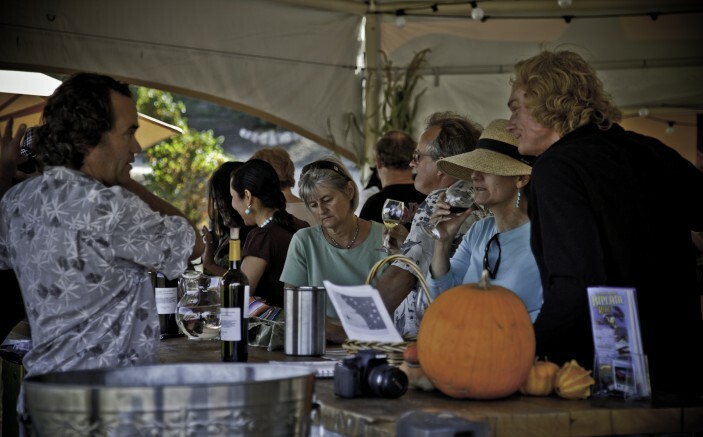 The two-day event is a chance to explore 35 member wineries, sample new and unfinished wines, enjoy delicious food pairings, and experience the beauty of wine country in autumn. 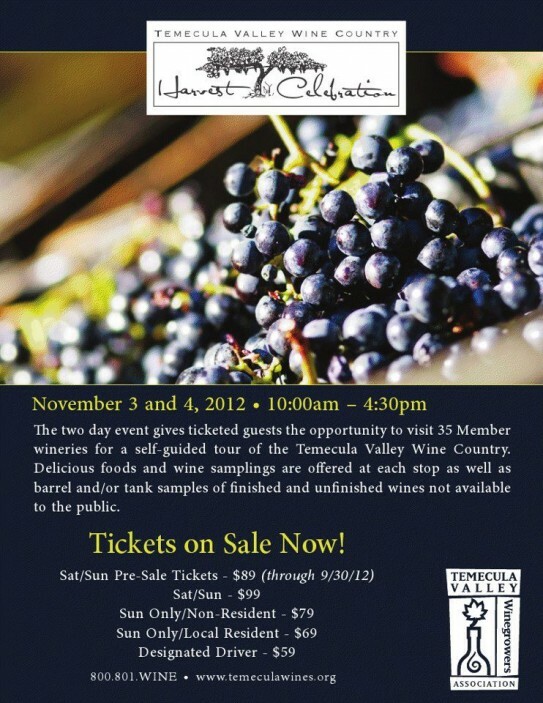 WHAT: 22nd Annual Harvest Celebration Barrel Tasting Weekend, a two-day event offering ticketed guests a chance to visit 35 Temecula Valley wineries on a self-guided tour. WHERE: Temecula Valley Wine Country is just 60-90 minutes from Los Angeles, San Diego, Orange County and Palm Springs. Exit I-15 at Rancho California Road and head east four miles. Purchase tickets online here or call 800-801-9463. TRANSPORTATION: Safe, chauffeured transportation available through Grapeline Wine Country Shuttle’s “Sip & Ride” package; includes a Harvest Passport ticket, souvenir glass, and pick-up / drop-off at multiple wineries. Visit www.gogrape.com/reservations for pricing and to book. Enjoy live music from folk rock, indie, and americana singer Jacqui Forman. Come by for the barrel tasting weekend after party! Check out Jason Weber (Sax/Jazz) at the Live @ Lorimar musical series! Enjoy live music in the Pavilion! Live musical performance by Kenny Marquez at the Harvest Barrel Celebration Weekend! If you haven’t already purchased your tickets to this fantastic event happening this Saturday and Sunday, November 6 & 7, 2010 from 10:00am – 4:30pm, there’s still time! After deciding which ticket option is best for you, order your tickets here. We look forward to seeing you at the 20th Annual Harvest Celebration Barrel Tasting Weekend! 20th Annual Harvest Celebration Reminder! The 20th annual Harvest Celebration Barrel Tasting Weekend is quickly approaching! Join us for this fantastic event on Saturday and Sunday, November 6 & 7, 2010 from 10:00am – 4:30pm. This two-day event gives ticketed guests the opportunity to over 30 Member wineries for a self-guided tour of Temecula Valley Wine Country. Delicious foods and wine samplings are offered at each stop as well as barrel and tank samples of finished and unfinished wines not yet available to the public. If you haven’t already ordered your tickets, this is a reminder to do so as soon as possible since this event does sell out early every year! Order your tickets here and we look forward to having a great time with you at the Harvest Celebration Barrel Tasting Weekend!